Here’s the third and final video for this week. 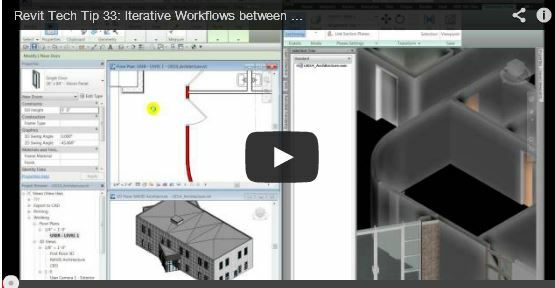 Today, we look at the possible workflows using Revit and Navisworks in an iterative process that users can adopt through design, pre-construction, and construction. Well that’s all the videos for this week. You can check out the full line of Revit Tech Tips on our YouTube Channel. Let us know what we haven’t covered yet that would be of interest to you. Contact us. For the past five years at Synergis, Bill has been training, supporting, and implementing the Building Solutions offered from Autodesk, primarily the Revit applications. His accomplishments include many certifications which include AutoCAD, AutoCAD Architecture, and Revit Architecture. He is also an Implementation Certified Expert for Revit Architecture and Structure. Bill’s latest achievement was acquiring the MEP Systems Specialist certification from Autodesk which has propelled Synergis as a Platinum Service Provider. Bill’s interactions with customers have provided him with constant challenges that lead him to think outside the box. As a result, he has authored several technical solutions for publications which include AEC Bytes and Cadalyst as well as, produced several tips and tricks videos for the Synergis Website and You Tube channel. He enjoys consulting with a many different Architectural or Engineering firms struggling to implement the BIM process using the Revit application. Bill has been certified many times on Autodesk products, including Revit Architecture, Revit Structure, AutoCAD , and AutoCAD Architecture.